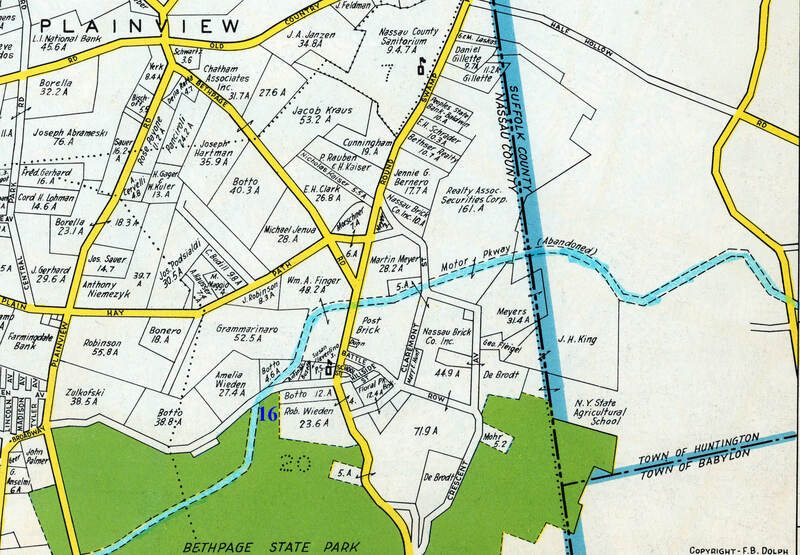 The first seven bridges were located in East Meadow and the Hempstead Plains (Levittown). The first bridge (#1) went over Merrick Avenue. Note the Meadow Brook Lodge in the background on the south side of the Motor Parkway. The second bridge of the race was a real challenge, curving to the east over Newbridge Avenue (#2), often confused with the Newbridge Road Bridge. Immediately after going over Newbridge Road, drivers needed to navigate under the Stewart Avenue Bridge (#3). The Motor Parkway went under the fourth East Madow bridge (#4) at Carman Avenue. The distinctive water tower of the Ladenburg Estate can seen through the bridge to the right. After the Motor Parkway curved back to the east, the drivers went over the Westbury Avenue Bridge (#5). Next came another curved bridge (#6) over Newbridge Road. 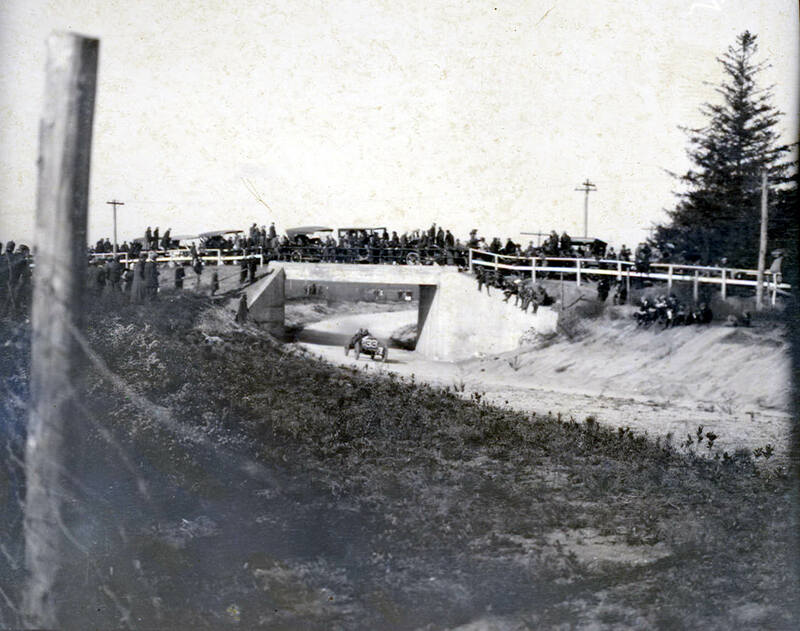 Note the spectators watching the races on top of the Newbridge Road Hotel. After passing the Start-Finish Line, the drivers went under the Jerusalem Avenue Bridge (#7). This was one of the most popular locations to view the action. If you look carefully, the grandstand on the south side of the Motor Parkway can be seen through the bridge in the background. Here is a map showing the location of the next eight Motor Parkway bridges primarily going over the major roads of Bethpage (then called Central Park). Note the crowds on this farmway bridge (#8) near Bloomingdale Road. Here the cars can be seen after navigating the Wantagh Avenue Bridge (#9) and approaching the Massapequa Lodge. This would be the last bridge for the 1909/1910 courses. The 1908 course continued on the Motor Parkway and included six more bridges. 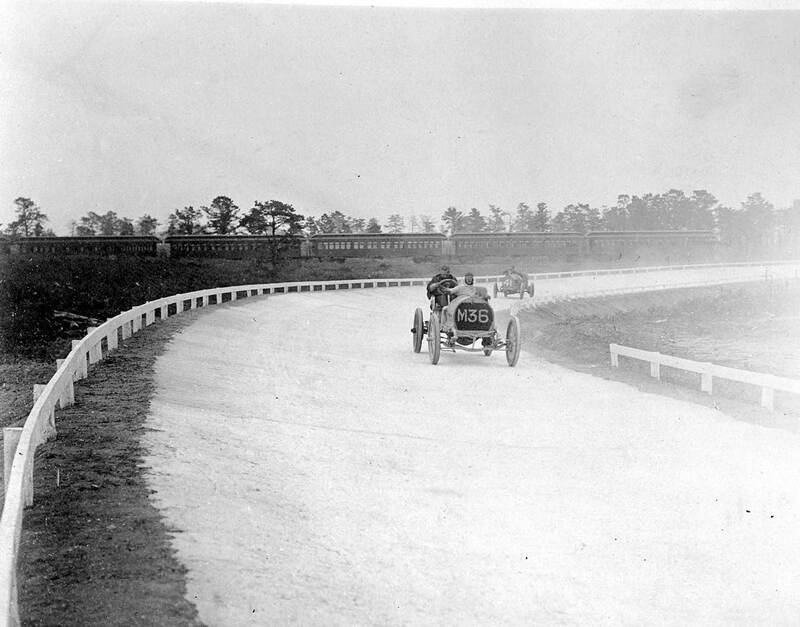 For the 1908 race the drivers did not turn off and went over the Massapequa-Hicksville Road Bridge (#10). Note the Massapequa Lodge to the right of Old 16 , the eventual winner of the 1908 race. Near the location of the June 6,1908 ground-breaking ceremonies for the Motor Parkway, the cars went over Jerusalem Road Bridge (#11). A Motor Parkway workmen's shed can be seen in the background on the left. To avoid confusrion with Jersalem Avenue, the name of the road was changed to Stewart Avenue. Of course, this name is very often confused with other Stewart Avenues located in Nassau County! 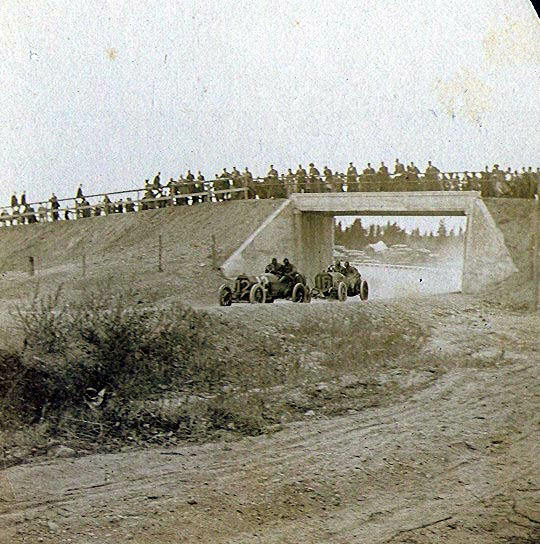 After passing the first Deadman's Curve, the racers drove on the bridge over Central Avenue and the Long Island Rail Road (#12). The steel trestle construction, rather than concrete, was mandated by the railroad. This is a rarely seen view of the farmway bridge (#13) conecting the west and east sections of the Nibbe Farm in Bethpage. This photo was taken from the Powell Avenue Bridge (#14) with a view of the crowds watching the race on the Plainview Road Bridge to the right. This is a closer look of Old 16 challenging the #12 Thomas after passing through the Plainview Road Bridge (#15). The last bridge for the 1908 Vanderbilt Cup Race was another farmway bridge (#16) connecting the Botto farm in Bethpage... now part of Bethpage State Park, the home of the 2002 and 2009 US Open. Soon after this point, the race course ended on the Motor Parkway and continued on to Round Swamp Road. Unfortunately none of these 16 bridges are standing today. Again - fantastic. I know the Levittown area well and just an hour ago was driving over the same general spots as the racers (Carmen Ave., Merrick Ave., Newbridge Rd., etc.) I often imagine being in one of those great old vehicles, however I know there were no speed traps in those days. the drivers went over the Massapequa-Hicksville Road Bridge (#10). Note the Massapequa Lodge to the right of Old 16 , the eventual winner of the 1908 race. Link has been fixed. Thanks! Thanks! I really enjoyed the visit to the Nassau County Police Museum! Just when I think I’ve been through your whole site, here are more rare photos of the parkway. Next best thing to a time machine!